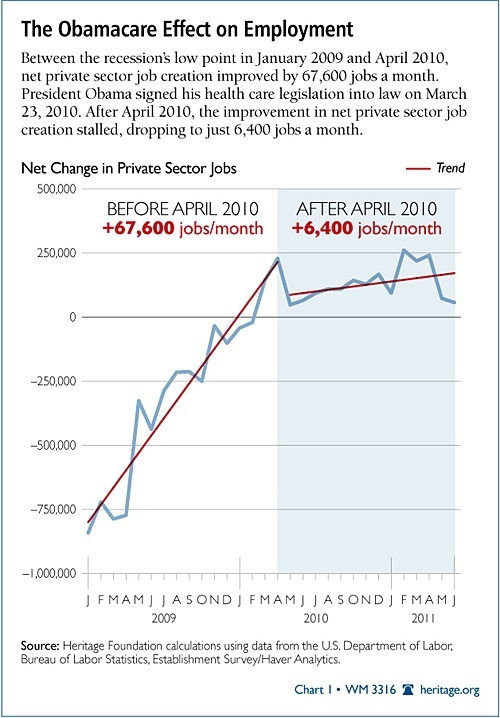 ObamaCare killed job creation when it passed. "But he didn't intend to." Maybe, but he did. The rate of job creation took a dive the very month after ObamaCare passed. ... From the recession’s low point in January 2009 until April 2010, when Obamacare went into effect, the private sector created about 67,600 jobs a month. After the president signed PPACA into law, that number slowed to a meager 6,400 jobs a month — a more than 90 percent decrease or less than one-tenth the previous rate.